Eilene M. Galloway is the woman behind the creation of the National Aeronautics and Space Administration (NASA). A prolific researcher and writer with the Congressional Researcher Service at the Library of Congress, Galloway helped write the National Aeronautics and Space Act of 1958, which created NASA and established the United States’ civil space program. She was influential in drafting legislation and treaties, while emphasizing the need for international cooperation and peaceful exploration of space. She also liaised with United States Federal agencies on issues of the peaceful uses of outer space. She worked extensively with the United Nations Committee on the Peaceful Uses of Outer Space and helped establish the International Institute of Space Law in 1960. You can view her bibliography here. Born Eilene Marie Slack on 4 May 1906 in Kansas City, Missouri, Galloway was the only child of Lottie Rose (Harris) Slack and Joseph Locke Slack. In 1912, Galloway and a group of girls from the Georgia Brown Dramatic School in Kanas City, Missouri, performed a patriotic song and dance for presidential hopeful Theodore Roosevelt at the Muhlbach Hotel in Kansas City. She attended Kansas City public schools, graduating from Westport High School. In fall 1923, she matriculated at Washington University in St. Louis, where she met George Barnes Galloway, who was working on his master’s degree. On 24 December 1924, she and George married and moved to Washington, DC, so that George could complete his doctoral degree. Eilene enrolled at Swarthmore College after the couple moved to Philadelphia for George’s career. In 1928, Galloway graduated with high honors and Phi Beta Kappa earning a bachelor’s degree in political science and went on to teach two years in Swarthmore’s political science department. She and George had two sons, David Barnes Galloway (Laguna Beach, CA) and Dr. Jonathan Fuller Galloway (Burlington, VT), six grandchildren, and five great-grandchildren. In 1931, Galloway and her family moved to Washington, DC. During the Great Depression. Galloway became assistant to Aubrey Williams, assistant administrator of the Federal Emergency Relief Administration (FERA). She oversaw adult education programs nationwide, specifically developing programs for the District of Columbia from 1934-1935. From this experience, she moved on to become a volunteer board member for the Family Service Association, compiling and creating a guide to adult education The Emergency Education Program and College Student Aid Program of the Federal Emergency Relief Administration, which was popularly received and reprinted. In 1957, Senator Lyndon B. Johnson, Chairman of the Preparedness Subcommittee of the Senate Armed Services Committee, asked Galloway to serve as Staff Consultant for hearings on United States preparedness in space. When the Senate organized the Special Committee on Space and Astronautics, Galloway formulated questions for witnesses and analyzed testimony. In 1958, Senator Johnson sent her to represent the United States at a meeting of the International Court of Justice in The Hague, where she gave a speech on the Community of Law and Science. At the same time, Representative John W. McCormack (D-Massachusetts), Majority Leader of the House of Representatives, approached Galloway for advice about establishment of a House Select Committee on Astronautics and Space Exploration, which in turn recommended the creation of a national space agency. Galloway assisted Representative McCormack and Senator Lyndon B. Johnson in drafting the National Aeronautics and Space Act (29 July 1958), which created NASA. She was particularly influential in drafting Section 205 of the act, which encourages NASA to conduct international space activities. Galloway advocated NASA be created as an administration rather than an agency, which enabled NASA to plan and coordinate across federal agencies the variety of activities involved in the development and uses of outer space. 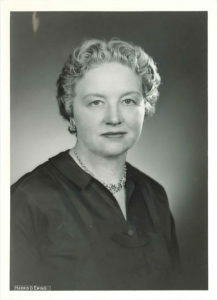 In 1958, Galloway helped establish the United Nations Committee on the Peaceful Uses of Outer Space (UNCOPUOS), where she represented the United States in many meetings and was editor of the Space Law; A Symposium (1958). In the 1960s, Galloway was America’s delegate and liason to UNCOPUOS for the International Astronautical Federation drafting treaties governing the exploration and uses of outer space, helping launch the field of international space law. She helped draft the Treaty on the Principles Governing the Activities of States in the Exploration and Uses of Outer Space, including the Moon and Other Celestial Bodies. Referred to as the Outer Space Treaty, the treaty entered into force in 1967 and has been signed by 125 nations and serves as the foundation for international space law. Galloway authored numerous papers, speeches and opinion pieces about space law and policy. She opposed the weaponization of space and believed international cooperation in space was essential. Galloway was also instrumental in creating the International Institute of Space Law, which serves as a worldwide forum for legal scholars and others to study and debate legal issues associated with the exploration and utilization of space. Galloway spent five decades advising and consulting organizations and agencies across the world, and her work and research benefitted her contemporaries as well as generations beyond. From 1958-1977, Galloway served as a special consultant to the Senate Committee on Aeronautical and Space Sciences, and from 1977-1982, she served in the same capacity for the Senate Committee on Commerce, Science, and Transportation. The Federal Communications Commission and the State Department asked her to assess alternatives and develop approaches for United States and international space policy and law regarding the exploration and utilization of outer space. She was also consulted on scientific aspects of space technology and policy by the United Nations; the National Academy of Sciences, the National Academy of Engineering, the United States Civil Service Commission; the United States House Committee on Science and Technology, Office of Technology Assessment; and the United States Senate Committee on Commerce, Science, and Transportation. Galloway was also a member of the Advisory Committee on the International Space Station and served on nine NASA advisory committees. Moreover, she served as a founding member, honorary director, and vice president (1967-1979) of the International Institute of Space Law (IISL), established by the International Astronautical Federation. In recognition, the IISL Manfred Lachs Space Law Moot Court Competition annually awards the Eilene M. Galloway Award for Best Brief. She was a member of the International Academy of Astronautics and a Fellow of the American Astronautical Society (1996). A member of the International Astronautical Federation Committee for Liason with the United Nations Committee on the Peaceful Uses of Outer Space and its Subcommittees, Galloway also served as President of the Theodore Von Karmen Memorial Foundation, Inc., and as a member of the editorial advisory board for the Journal of Space Law. She participated in professional societies and symposia and chaired panels sponsored by prominent institutions and organizations, including: the European Space Agency, the United Nations University, George Washington Law School, the International Studies Association, the Federal Bar Association, the John Basset Moore Society of International Law, and McGill University in Montreal, Canada. Galloway received honorary doctorates from Lake Forest College (1990) and Swarthmore College (1992), and was a member of Phi Beta Kappa and Kappa Alpha Theta. The first woman elected Honorary Fellow of the American Institute of Aeronautics and Astronautics (2006), Galloway was an honorary director of the International Institute of Space Law, Trustee Emeritus of the International Academy of Astronautics and a honorary member of the Lunar Society of International Law. Galloway’s lifetime achievements were consistently honored by numerous organizations. In 1984, NASA honored Galloway with its Public Service Award and Gold Medal for her achievements in advising Congress about outer space and her service to international organizations including the United Nations regarding international space law. She was the first recipient of the Lifetime Achievement Award from Women in Aerospace in 1987. The National Aeronautic Association honored Galloway’s personal contribution to the advancement of aviation with its Katharine Wright Memorial Trophy. She was the recipient of the International Astronautical Federation, International Institute of Space Law with the Andrew G. Haley Gold Medal for Space Law and the Lifetime Achievement Award, and she also garnered the Theodore Von Karman Award from the International Academy of Astronautics and The Cologne University Institute of Air and Space Law and German Aerospace Center Award. The American Astronautical Society conferred upon Galloway the John F. Kennedy Astronautics Award for outstanding contributions covering 40 years of outer space service to the UNCOPUOS and the development of space law. Her last contribution to the Journal of Space Law was, Maintaining International Space Cooperation for Peaceful Uses, 30 J SPACE L. 311 (2004). The Eilene M. Galloway Collection contains more than 13 linear feet of professional and private correspondence, manuscripts and publications, reflecting Galloway’s prolific writings during her fifty-two years as a law and space policy specialist. A guide to the Collection can be found here. Eilene Galloway was a prolific writer during her 52 years as a space policy and law specialist. In 1999, her friend Margaret Roberts organized all of the copies of Eilene’s non-congressional writings and publications that Eilene had at her home. Though it is an impressive collection, it is not complete. Other pre-1999 publications are included in a list that appears in Space Law: Development and Scope, by Nandasiri Jasentuliyana, ed., pp 257-261. The following list therefore is a work in progress. Citation information is provided as available. Additions or corrections are welcome. You can view the bibliography here.